Although 2016’s intense drug cartel thriller Sicario brought in a respectable $47 million at the box-office, it was far from being a shoo-in to warrant a sequel. 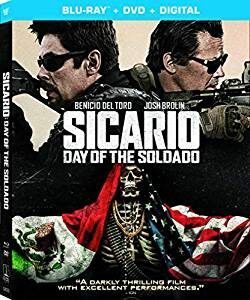 Well, surprise, surprise, Sicario: Day of the Soldado has arrived three years later. And though it wades into a milieu similar to that of the original, there are still some marked differences. Missing in action this time is Emily Blunt as the tough-as-nails government operative who gets a jarring first-class lesson in gray area ops on both sides of the border. But back in this go-round are Benicio Del Toro (Inherent Vice) as Alejandro, a cold-blooded assassin working for American interests and Josh Brolin (Hail Caesar) as Matt, a Fed who gets border issues resolved by either bending or ignoring the law. Rather than drugs, which was the focal point of the first effort, the emphasis here is on illegal immigration this time out, as a plan is hatched to pit one cartel against another by snatching the teenage daughter (Isabela Moner, Transformers: The Last Knight) of a powerful gang leader. This, American authorities believe, will turn one criminal organization against the other. The first Sicario film, penned as this one is by Taylor Sheridan (Hell or High Water, Wind River), was a slam-bang mix of hair-raising action, forceful drama and heady politics, powerfully put-together by French-Canadian director Denis Villeneuve (Arrival) . Replacing Villeneuve in this outing is Stefano Sollima, the Italian director of the acclaimed 2014 Gommorah TV series, and he takes the film into a more genre-comfy area. The violence and sometimes over-directed action sequences remain, but the original’s thought-provoking complexities are gone along with the stalwart presence of the female lead memorably essayed by Blunt. 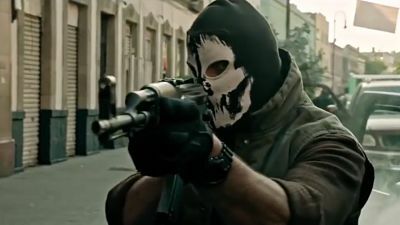 Despite mixed reviews, Sicario: Day of Soldado did better business than its precursor, finishing its theatrical run with close to $50 million following a strong opening week. Fans of the original who skipped this outing in theaters will likely make their Day by checking out this fictionalized account of a troubling, real-life drama that’s played out every day.